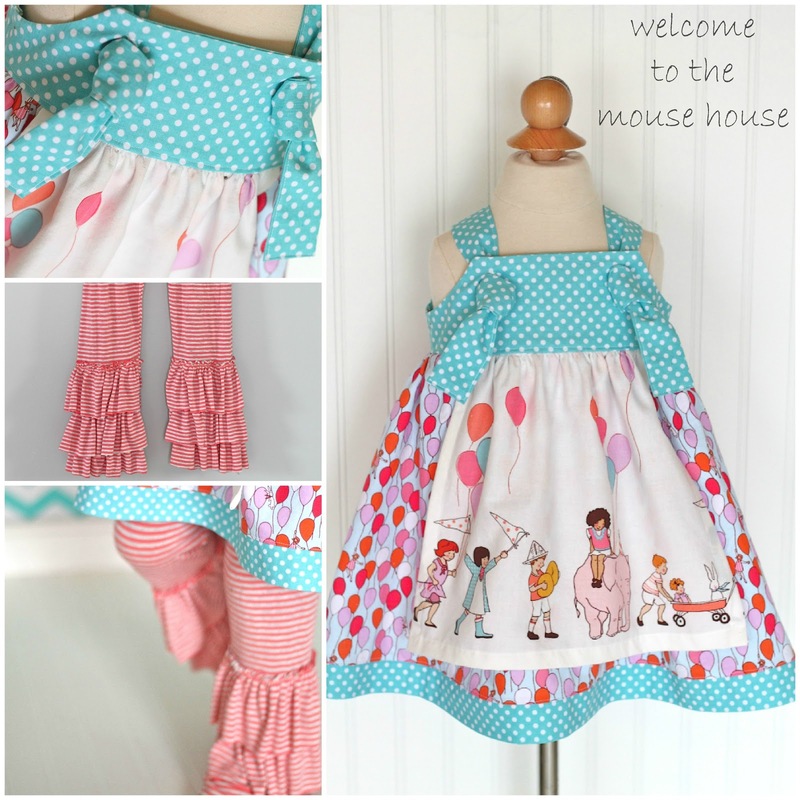 My name is Hayley and I blog over at Welcome to the Mouse House. I was a competitor on the last season of Project Run and Play and it was one of the best experiences ever! I am thrilled to be a guest judge this week, even though I know it will be a tough decision to make. The ladies this season are seriously talented, right??? 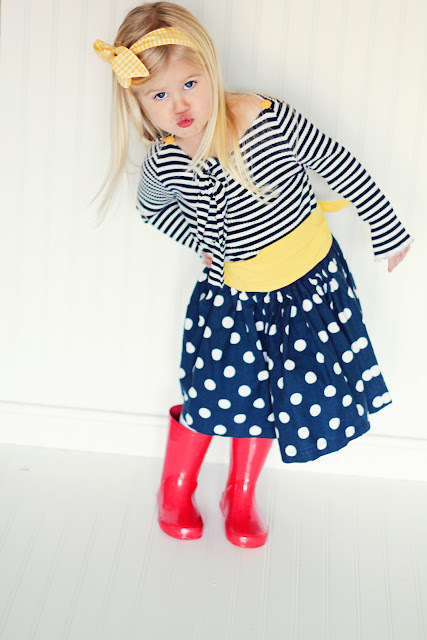 The theme for this week is "stripes and polka dots". It doesn't get much more fun that that! 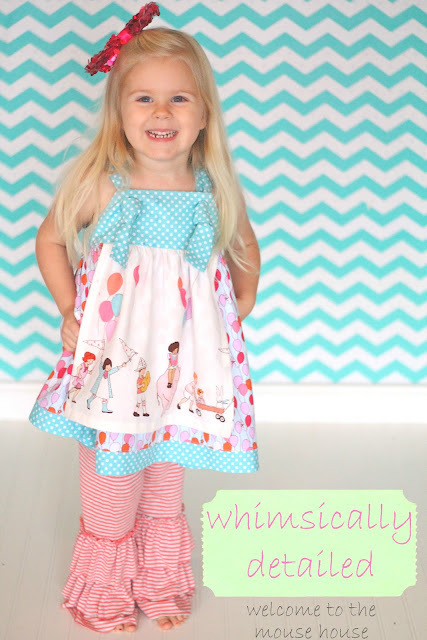 I am here today to show two very different outfits that I created for my daughter Ainsley and also some tips on mixing and matching these patterns together without overdoing it. 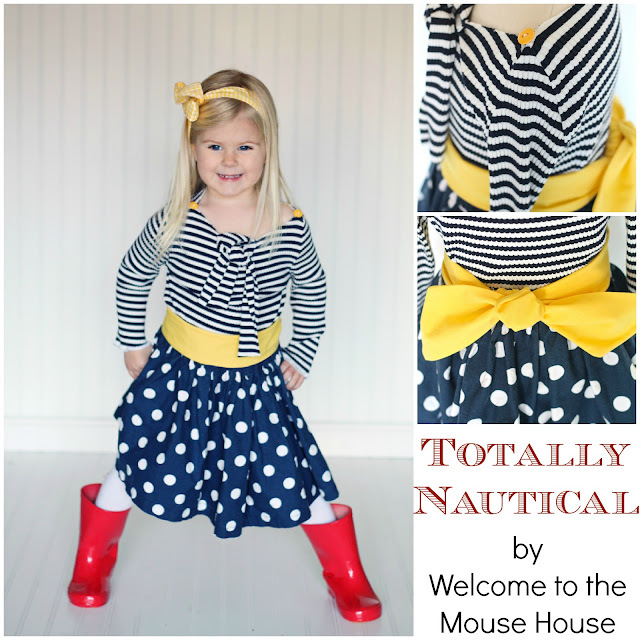 The first outfit is nautical inspired. I absolutely ADORE navy blues, reds, and yellows together and my mind automatically drifts to sailboats and the ocean and Ralph Lauren. During my season on Project Run and Play, I created an outfit with very similar colors (read more about that outfit HERE) and in fact, I decided to reuse that same shirt, but I simply switched out the buttons on the shoulders. When mixing patterns, it is very important to keep proportions and colors in mind. Notice that the stripes are smaller in proportion to the polka dots and the color palette is very much within the same level of saturation. It comes across as purposeful, not "clownish". It is whimsical and totally appropriate for a 3 year old with attitude. People often comment on how much they love my fabric choices and how unexpected they are. It takes time and practice to understand how to mix and match, but trying is the only way to learn! 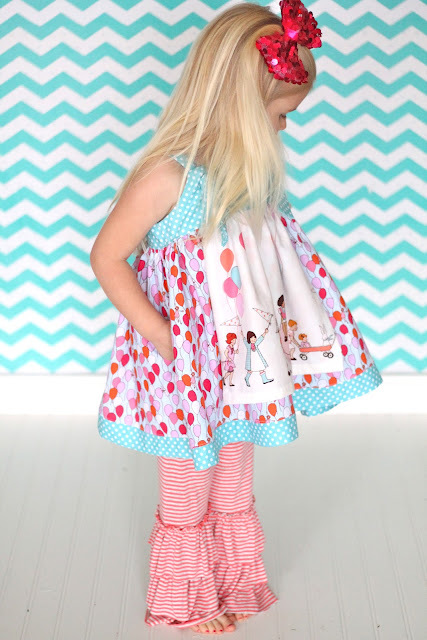 For those intimidated, start out using a line of fabric that the designer has already coordinated for you…. eliminates the guesswork and you are guaranteed an adorable combo of fabrics. I really hope that these tips and pictures helped you or inspired you to mix and match different patterns and colors! And just because she is cute…. 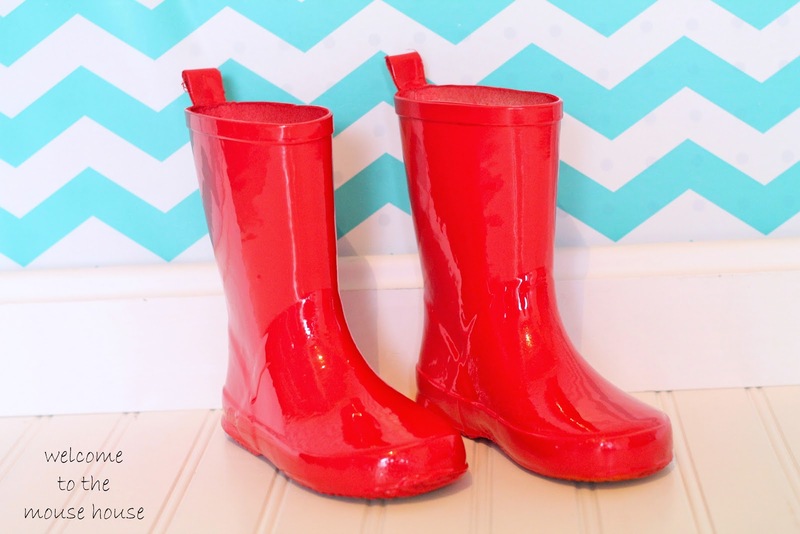 Later this week, I will blog about how we created Ainsley's red boots. I would love for you to check out my blog Welcome to the Mouse House for that and other fun ideas! Good luck again to all the lovely ladies this season! thanks girl! 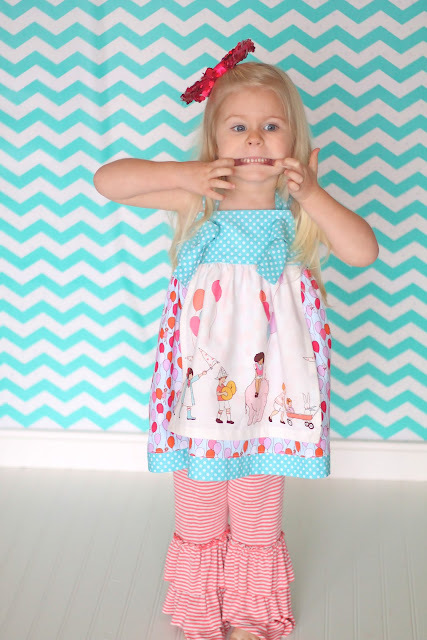 I absolutely adore Sarah Jane fabrics too! Wha? You created her boots? Alright...I just have to know how that was done! Cute outfits. I love those ruffled pants. I'd love a tutorial on those. I've tried doing ruffles on knit leggings and it was a disaster. Both outfits are adorable. It helps to have such a cutie for a model. I would love to know how your created red boots. They are awesome! Where do you buy your knit fabrics from? I'm looking for a quality knit to sew with, but our local stores carry a very limited supply. 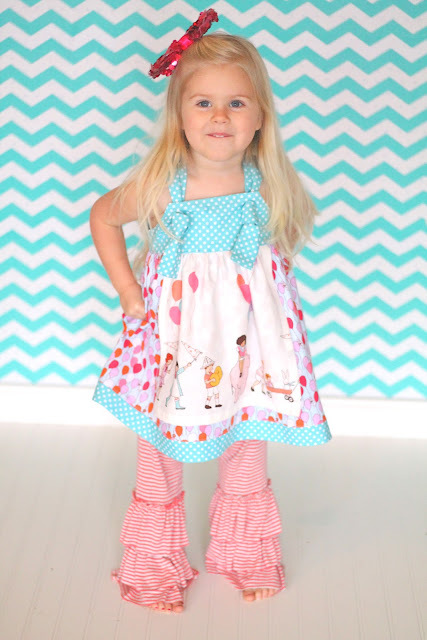 Deborah, I buy most of my fabrics online because they tend to be higher quality and there are definitely more choices! Deborah, nice knit fabric online try the Fabric Fairy, Banberry, Near Sea Naturals, Girl Charlee, Chez Ami ( they sell fabric in addition to clothes). Hope that gets you started. Oh, fabric.com and spandex house too. thanks Georgine…. I haven't heard a few of those and I am going to check those out today! LOVE both of these, but my favorite is the nautical... classic blue and white with the pops of yellows, and those red shoes!!! Sucker for red ;o) And your model is simply gorgeous - that smile, how do you ever say 'no'? Oh I love the nautical one! So good! I've only just started mixing patterns lately, it feels adventurous! Great tips Hayley! How exciting to be a judge!!!! 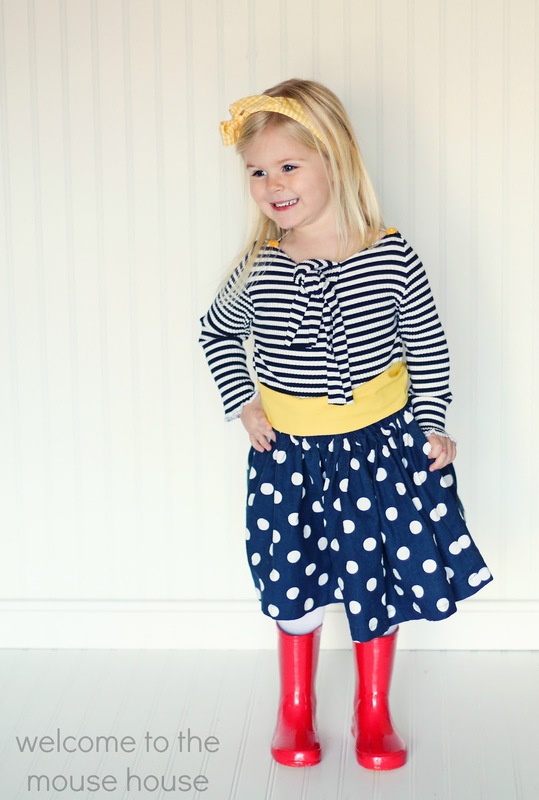 Your Ainsley is the most adorable model.